Artists Lundahl & Seitl give you a taste of their extra-sensory Royal Academy tour. 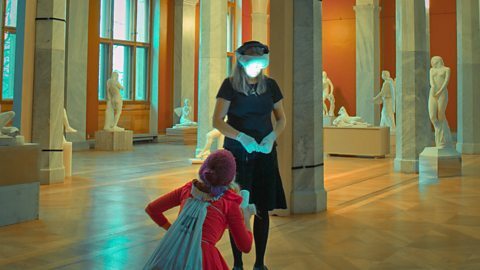 Swedish artists Christer Lundahl and Martina Seitl are offering visitors to the Royal Academy of Arts the chance to take a journey with a sensory twist. In London for the first time, the pair's Symphony of a Missing Room: Archive of the forgotten and remembered takes visitors around the gallery wearing headphones and sightless goggles. Playful unseen guides lead them around the space, while a voice coaxes you in a certain direction. Small groups of people taken on this tour experience the duality of sensory deprivation coupled with extra-sensory stimulation through movement, touch and 3D stereo sound coming through their earphones. They are steered away from the tangible world and diverted into a new sense of time, space and self, which forms the essence of the artists' work. Lundahl & Seitl's work responds to the centuries of history at the Royal Academy's London home, and the notion of hundreds of works submitted to the 2014 Summer Exhibition and not yet hung in place. This is a work they first unveiled in Stockholm five years ago and has been evolving ever since in venues around the world. Lyn Gardner reviewed Symphony of a Missing Room for The Guardian, and said her experience at the Birmingham Museum and Art Gallery was "like falling into your own personal fairytale or going through the wardrobe into Narnia." "You are seduced by the gentle voice in your ear, and by the hands that flutter around you like birds. Yet never for a moment do you feel out of control - it is, after all, your own imagination that gives this work its wild power." The film is a representation of the Symphony of a Missing Room tour at the Royal Academy which takes one hour to complete. This is not a documentation of the work, but an interpretation of it for BBC Arts Online. Presented by LIFT and the Royal Academy of Arts, Lundahl & Seitl's Symphony of a Missing Room continues at the Royal Academy with six tours a day until 8 June. Who are Lundahl & Seitl? Christer Lundahl and Martina Seitl formed their creative partnership in 2003, and live and work in the UK/Sweden. For the last 10 years they have created transformative experiences in museums and galleries, in the theatre, and in science and design collaborations. Their research has focused on how habits have ultimately formed the cultural institutions that are known as the museum and theatre and how their histories have formed visitors' expectations of them. Lundahl & Seitl is a trans-disciplinary collaboration that focuses on making the viewer's perception the central medium of an artwork. Their artworks epitomise a "new kind of art" that break down the perceived barriers between doing and viewing, leading to the conception of powerful events that effectively take place in, and as a result of, the consciousness of the work’s visitors. Each project is specific to a particular place and/or situation, investigating history, time, space and human perception. Their practice is preverbal: challenging and then re-connecting the disciplines of science, performance and art and its institution. Their work includes: curatorial projects, workshops, performance, exhibitions and seminars and works for software, often in collaboration with architects, designers, dancers, choreographers, writers, actors, musicians and scientists.